Jan 23, 2011, Haflong: The 100 hour Dima Hasao bandh called by the Indeginious Peoples’ Forum since Friday (Jan 21) evening has affected normal life in Haflong, Mahur and Harangajao areas of NC Hills district. The bandh has been called in order to register their demands for bifurcation of NC Hills district and creation of a separate Autonomous Council. The bandh is likely to affect the first year Higher Secondary examination scheduled to be held from Monday (Jan 24). All the Government officials including the Deputy Commissioners’ and the Autonomous Council offices, business establishments, shops, markets and banks remain closed on Saturday (Jan 22). Vehicular traffic on the roads except the security vehicles were not plying during the bandh hours. However, the bandh has not affected normal life in Maibong, Lanting, Diyungbra, Gunjung, Dehangi and Umrongso. Buses between Shillong and Umrongso, Lanka and Umrongso were plying without disruption. The bandh has not affected the normal works of the NEEPCO. Security throughout the districts has been alerted due to the bandh. 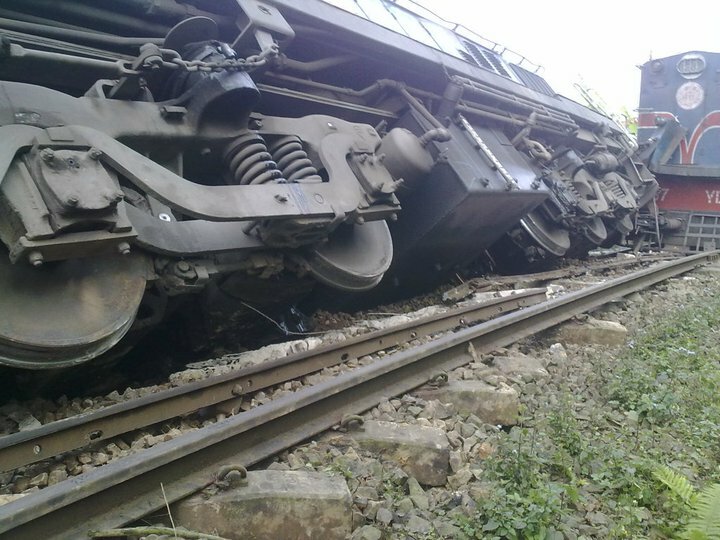 However in the afternoon at around 2:30 PM, goods train headed to Badarpur in Karimganj district got derailed due to missing fishplate at around 2 Kms from Lower Haflong , engineered by some miscreant suspected to be activist of North Cachar Hills Indigenous Students’ Forum . The Dima Halam Daogah (Joel) calls for 24 hours Dima Hasao bandh starting from 5 AM, January 3 in protest against the non-release of its leaders and members. The DHD(J) has been demanding release of its Chairman Joel Gorlosa, C-in- C Niranjan Hojai and other members since long. Phaiprang Dimasa, Vice-Chairman, in a press meet held at designated camp at Red cross, Jatinga argues if Aravinda Rajkhowa and other leader of ULFA could be released on bail then why not the DHD(J) leaders ? It is to be mentioned here that the DHD(J) had surrendered their arms before the Chief Minister, Assam on October 2, 2009 with the hope of peace talks with government but even after more than one year neither any peace talks nor their leaders are being released. DHD(J) expresses serious concern over the Govt’s discriminating attitude towards the DHD(J) and threatens for stronger agitation soon. Expressing serious concern over the apathetic attitude of the State Government as well as Dima Hasao Autonomous Council, Sri Elisha Chingthong, former Executive Member of erstwhile N C Hills District Council reiterated the demand of creation of a Civil Sub-Division at Umrongso as the best solution to the plight of the people of Umrongso in particular and of Garampani constituency in general. Sri Chingthon was the executive member during 1980 to 1987 and during his tenure all most all the heads of developmental departments like PHE, Industries, PWD NEC etc were established. In the year 1984 NEEPCO also was commissioned. Talking to this correspondent Sri Chingthong who is now the Advisor of Somidar Karbi Amei (SKA) disclosed that on October 19th, 1982 a memorandum was submitted to the then Governor of Assam Prakash Mehrotra by the then Chief Executive Member, N C Hills District Council K. K. Hojai at NEEPCO, Umrongso with the proposal of creation of Civil Sub-Divisions at Maibang and Umrongso. In the year 1986, Maibang Sub-Divison was created but the demand for the creation Sub-Division at Umrongso remained as it were. He said ‘absence of a sub-Division at Umrongso is the prime cause of concern among the people of the locality. Umrongso being situated at a distance of 120 KM from district Head quarters Haflong, presence of governance is seldom felt by the people at Umrongso. For the district administration also, it is a trouble some job to administer. And Umrongso being the only industrial town and the prime source of revenue, it has become the need of hour to create Umrongso a Civil Sub-Division soon. Answering some question of this correspondent, concerned with the present anarchies in the district of Dima Hasao, Chingthong said ‘in our days the political leaders were made by the people and we were the servants of the public. We had to work for the development of these people but now the leaders are made some other else not the people, therefore they have to serve those people who have made them political leaders. Earlier, the leaders were to work for the people for at least few years then they were allowed to contest in the election but now a days the leaders are made over night, there is no need for any social to do by them, in short these are the prime cause for the political wavering in the district’. Guwahati, Dec 7: DHD (J) chief Jewel Gorlosa, along with two members of the Dimasa rebel outfit, will be interrogated by the Directorate of Enforcement in connection with the diversion of funds meant for the NC Hills Autonomous District Council (NCHADC) to other States through hawala. The Court of the Special Judge, Assam today granted permission to the Directorate of Enforcement to question Gorlosa and two DHD (J) members – Samir Ahmed and Partha Warisa. The court, however, did not give permission to the Directorate of Enforcement to quiz DHD (J) “commander-in-chief” Niranjan Hojai on health grounds. The Directorate of Enforcement had earlier sought the court’s permission to interrogate Gorlosa, Hojai, Ahmed and Warisa. The court directed the Directorate of Enforcement to complete the process of interrogation of the trio within six weeks. Hearing the Enforcement Directorate’s plea for permission for quizzing the DHD (J) men in question, the Court of the Special Judge, Assam said Gorlosa, Ahmed and Warisa would be able to seek the services of advocates during interrogation if they so desired. The court also made it clear that the Directorate of Enforcement would not put the questions to Gorlosa, Ahmed and Warisa that the CBI and National Investigation Agency (NIA) had asked them. Hojai has been undergoing treatment at Gauhati Medical College and Hospital (GMCH) since August 21. He was admitted to the GMCH after his health condition deteriorated while observing fast unto death, demanding the release of the jailed DHD (J) leaders. HAFLONG, Dec 7 – In two separate incidents, unidentified miscreants kidnapped six persons from Dehangi and Maibang at about 3 am today. They are Joybo Maramsa (55), Hamring Maramsa (46), Hamjen Maramsa (40), Kajol Maramsa (38) from Dehangi and Debendra Hasnu (32), Roben Hasnu (35) from Maibang. Police has launched a combing operation to rescue the kidnapped persons. NEW DELHI, Dec 6 – The Public Accounts Committee (PAC) of the Parliament has called for the report of the special audit of the accounts of the North Cachar Hills Autonomous Council conducted by the office of the Accountant General. Member of the committee, Ramen Deka said that the report is likely to be discussed in the next meeting of the committee headed by Dr MM Joshi of the BJP on December 7. Meanwhile, the PAC has formed a sub committee to examine the allegations of misuse of funds of the non lapsable pool of central resources in the NE states. GUWAHATI, Dec 6 – The Social Welfare Department of the North Cachar Hills Autonomous Council was one of the worst in terms of misappropriation of funds and there was direct evidence of siphoning off of more than Rs 13 crore in one particular instance apart from other glaring irregularities. On the other hand, there were no records of utilization of huge sums of money withdrawn from the accounts of the Health Department of the Council. According to the report of the special audit of the accounts of the Council carried out by the office of the Accountant General (AG), during the audit, it was found that there was shortage of cash amounting to Rs 13.67 crore in one particular instance. The report said that scrutiny of seven cash books maintained by the Deputy Director, Social Welfare, Haflong , showed closing balance of Rs 18.66 crore on the date of seizure of the records by the National Investigating Agency. However, the bank statements showed closing balance of only Rs 4.99 crore and there was shortage of Rs 13.67 crore. Thus the probability of siphoning of Rs 13.67 crore cannot be ruled out, the report said. However, that was not the only case of misappropriation of funds by the Social Welfare Department of the Council. The report revealed that there were number of instances of presumptive siphoning of funds, unsubstantiated disbursement and withholding of social benefits and even funds meant for old age pension were misused. The cash book maintained by the Deputy Director, Social Welfare revealed that a bank draft of Rs 69 lakh was received from the Director, P&RD, Guwahati for implementation of national old age pension scheme but the amount was neither deposited in the personal ledger of the Council nor it was reflected in the bank account of the DDO. Interestingly, the cash book reflected that the amount was disbursed among 8632 persons but no sanction order, list of beneficiaries, records of deposit in bank account etc were not available. In such a scenario, siphoning of the fund meant for old age pension cannot be ruled out, the report said. The report said that the expenditure of Rs seven crore for implementation of specific schemes for economic uplift of the BPL families could not be substantiated, while, there was doubtful expenditure of Rs 4.50 crore for an infrastructure development scheme. Similar was the situation in the Health Department of the Autonomous Council. The AG report said that a cheque amounting to Rs 1.90 crore was drawn by the Principal Secretary of the Council though he was not the authorized DDO. It was reported that of the amount, Rs one crore was drawn for purchase of medicines, Rs 60 lakh for implementation of health care schemes and Rs 30 lakh for incentive to doctors and purchase of medicines. The administrative approval and financial sanctions, requisition for fund, supply orders, vouchers etc were not available for the audit. However, the Joint Director, Health Services, Haflong, confirmed that except receipt of Rs 15 lakh for payment of incentives for doctors, no medicine was received from the supplier or from the Council. Thus, there was no documentary evidence of utilization of Rs 1.75 crore, the report added. The special report by the Comptroller and Auditor-General (CAG) on the eight departments of the NC Hills District Autonomous Council (NCHDAC) — or rather the failure of the Assam Government to file the report at the Winter Session of the Assam Assembly and the attempts now made by Assam Chief Minister Tarun Gogoi to evade responsibility for the swindle as Finance Minister of the State—has shocked the people of the State unlike anything they had encountered before. The sense of shock is all the greater because it was Tarun Gogoi who had made it a point to underscore his government’s commitment to transparency and accountability in governance above all else when he became Chief Minister of the State for the first time in 2001. It was he who had mooted the Right to Information Bill in the State for the first time and left no stone unturned to have it enacted as a law. I recall his meeting with senior editors of newspapers within a month of his becoming Chief Minister in 2001. One of my first questions to him was about his priorities. He did no even hesitate in his answer. He said his first priority was a transparent and accountable government. He told us how anxious he was to have the Right to Information Bill passed and then to have it made a law. He did this in record time, but he had possibly failed to envisage the full implications of putting such a powerful weapon in the hands of the people. Today all the enthusiasm of 2001 about having a transparent and accountable government is completely missing. In fact, there are reasons to believe that he must be regretting his ‘rash’ decision to legislate the Right to Information (RTI) Act. There are clear signs that he has distanced himself from his pet programme. One has only to look at the number of departments in his government that have begun to defy the RTI Act by refusing to answer the questions posed to the departments concerned. And the office of the RTI is located at the third floor of the Statfed building near the Guwahati Medical College Hospital. It is a building without a lift—one that no minister would ever visit even to find out how the RTI office is functioning. In other words, everything possible has been done to discourage people from going anywhere near the RTI office. In short, the RTI Act is now regarded as one of those bloomers that the Assam Government should have avoided. After all, here is a government that beats all others in its ability to be opaque. Here is a government that beats all other State governments in India in corruption. This is not just the opinion of the people. It is also what Transparency International has said. Quite obviously, the most corrupt State government in the country cannot have anything to do with a law like the Right to Information Act. This law and corruption cannot co-exist. It may be edifying to go back to the time when The Week put out a story about the involvement of some ministers of the Assam Government in the NC Hills swindle which was reported to be worth Rs 1,000 crore. There were prompt knee-jerk reactions from both Rockybul Hussain and Himanta Biswa Sarma. The first threatened to file a libel suit against The Week and the second was reported to have actually done so. Following suit, even the Government of Assam threatened to take the magazine to court. Where are the cases that the State government threatened to file? What happened to the libel case that Himanta Biswa Sarma was reported to have filed? Were all the statements no more than mere sabre-rattling? Was the State government scared to file a suit because it was afraid of opening up a Pandora’s box? Obviously, there must have been a lot of truth in that report even though the State government eventually managed to bully the magazine’s publishers into tendering an apology and not following up on the report. The special report of the CAG that the State government failed to present before the Assembly is full of the diverse kinds of financial irregularities committed by the State government that one can associate only with rampant corruption. For instance, massive funds, far in excess of the budgeted allocations for NCHDAC were received by the council during 2007-08 and 2008-09. But there is no evidence of supplementary demands having been made to the State government for the additional releases of funds. There has been evidence of funds released for one department having been diverted to other departments without anyone’s permission or sanction. Crores of rupees had been diverted in this way. The government failed to furnish documents that the CAG’s investigators had asked for on several occasions. The Chief Minister’s reluctance to admit that the special report of the CAG had indeed been received is most puerile and pathetic. When Prafulla Kumar Mahanta, leader of the Opposition had got hold of a copy of the CAG’s special report, the Chief Minister wanted to know how he had got it when the report had been with the government for weeks before that. In fact, this was stated in the Assembly as an answer given by Kharsing Ingti, Hill Areas Development Minister to a starred question raised by an AGP MLA. Even so, the Chief Minister had to pretend at a press meet that he knew nothing about the CAG report having been submitted to the government. In doing so, he fumbled and mumbled and ended up giving incoherent replies. Such acts enhance the image neither of the Chief Minister nor of the State government. However, it is the latest statements of the Chief Minister that come as the last straw on the camel’s back. The first statement is one that seeks to buy time. The Chief Minister has said that the special report of the CAG is no more than an inspection report and that the proofs of corruption listed in the special CAG report could be accepted only when the final report was submitted. This is no more than a pathetic and childish attempt to buy time. Does the Chief Minister honestly believe that the final report of the CAG will differ materially from what he calls the ‘inspection report’? He knows very well that it will not. But he has to stubbornly carry on the charade of pretence as in the case of the illegal migrants from Bangladesh, the voters list of the State that is crammed with the names of illegal alien voters or the pretence that he will not yield an inch of Assam’s land to any neighbouring State after over 87,000 hectares of Assam’s territory has already been grabbed by neighbouring States. The second statement is that though he is Finance Minister of the State, it is not possible for him to keep track of where the funds meant for each and every department go or how they are used. “If I am to blame for any financial irregularities in NC Hills, Union Pranab Mukherjee will also be responsible in such a situation because of the Centre’s direct funding of the council,” he said earlier this week. This is a way of saying that in his State the buck does not stop anywhere at all—not even with the minister of the department concerned. He cannot escape responsibility by saying that the Union Finance Minister is also responsible. If he is, let him share the responsibility. But to claim that the minister cannot be held responsible is like saying that when a newspaper is sued for libel, the editor is not responsible. Such arguments will not wash. Nor will the argument that the release of Rs 11.45 crore to the NCHAC without budget provisions was just a practice which also happened during the AGP days. In that case, both regimes are guilty of serious financial irregularities. But Gogoi cannot hope to escape responsibility on the sophistry of “two wrongs make a right”. Chief Minister Tarun Gogoi has proved only one thing. It is that this government of his which sought to make transparent and accountable is one that cannot survive a day without corrupt practices. He also seems to think that there is no need to move from darkness to light. Everyone in his government seems to feel safer moving from darkness to deeper darkness. Guwahati, Dec 4: The all-party meeting on the special CAG report on financial irregularities in NC Hills today decided that memoranda would be sent to President Pratibha Patil, Prime Minister Manmohan Singh and State Governor JB Patnaik seeking action against all those named in the reports of the CAG, Manisana Singh Commission and National Investigation Agency (NIA) on the multi-crore-rupee NC Hills scam. While AGP MLAs will stage dharna on the NC Hills scam at New Delhi on December 8, Krishak Mukti Sangram Samiti (KMSS) members will organize dharnas across the State on December 9. The State Government has recently become active on the issues of special CAG report on NC Hills scam and big dams. On Friday night, Chief Minister Tarun Gogoi met the Chief Secretary, the Principal Secretary (Finance), the Principal Secretary (Hills Areas Development) and the Legal Remembrancer (LR) on the special CAG report on the NC Hills scam. The Cabinet today again discussed the special CAG report along with the issue of formation of corpus fund for downstream impact management in the State. The State Government has already decided to create a Rs-100 crore corpus find for downstream impact management. On the other hand, the Chief Minister today held separate meetings with NHPC executive director BR Saraf, State Power Minister Pradyut Bordoloi, the State Chief Secretary, the Principal Secretary (Finance) and others on the big dam issue. The Opposition in Assam is currently engaged in a hue and cry over the report of a Special Audit conducted by the Comptroller and Auditor General of India on financial irregularities in the North Cachar Hills (Dima Hasao) Autonomous District Council for the period 2007-08 to 2009-10 (till 12 June 2009). The CAG report basically points out two things — that the District Council had got an amount of Rs 272 crore from the State Government in excess of the budgetary allocation between 2007 and June 2009; and that there has been gross financial irregularities in the district, leading to strong chances of financial misutilization or misappropriation. In fact, it is now confirmed that there has been a big financial scam in the district council although the extent of the scam will come out now that the CBI too is on the job. Excess receipt of funds is nothing new but what is actually significant is the financial misappropriation that the CAG report has prima facie found. Since both the CAG audit and the CBI probe are being carried out at the behest of the Assam Government and the Centre, it remains to be seen if the probes are taken to their logical conclusion. Now, we have access to the charge sheet filed by the National Investigation Agency (NIA) at the court in Guwahati on October 18 on its probe into the North Cachar Hills terror funding and linkages. The NIA has named 16 people in its charge sheet, accusing them of having links with the Jewel Garlossa faction of the Dima Halam Daogah (DHD-J) and funding the rebel group by diverting funds meant for the NC Hills District Council through various means, including hawala transactions from Guwahati and Kolkata. What I found most significant in the charge sheet is the NIA’s description of accused number four, Mohet Hojai, the former chief executive member (CEM) of the NC Hills District Council. Hojai has not just been identified by the NIA as the former CEM, he has also been identified as a DHD-J member. In fact, the NIA has said in its charge sheet that it was under Mohet Hojai’s orders and direction that government officials and contractors had encashed money through cheques issues issued in the name of non-existent people and by using false and fabricated documents. If we put two and two together — the findings of the Special CAG Audit and that of the NIA— it would emerge that embezzlement of public funds did take place in NC Hills and that large chunks of these funds were diverted to the DHD-J militant group that had carried out a reign of terror in the district until the security crackdown, leading to the arrest in Bangalore of its chief Jewel Garlossa in June 2009 and the subsequent surrender by more than 300 DHD-J cadres on October 2, 2009. Significantly, the NIA has established the fact that funds received by the DHD-J reached the hands of known arms dealers and were used to procure weapons and ammunition for the group. Look at this observation by the NIA on its charge sheet: “The main activity of DHD-J was to siphon off government funds through extortion and with the help of elected members of the Council, contractors and government servants in order to finance their subversive activities…” These facts shows it was a heady cocktail of funds, guns and power that had engulfed the district’s governance and administration. All the key players are now in judicial custody, including Mohet Hojai, Jewel Garlossa and the DHD-J’s commander, Niranjan Hojai, besides at least two senior government officials. And yes, the cadres of the group who are lodged at designated camps in the district ever since their surrender more than a year ago, are getting restive and wants their detained leaders released. In fact, both the detained leaders and the cadres who are at the designated camps had resorted to a fast to press for the release of those of its members who are in jail. They want the ‘peace process’ with the group to begin and for this want their leaders freed. The government no doubt is in a catch 22 situation. Can it talk to the DHD-J after the NIA’s findings? The talks aside, since the NIA probe has established clear linkages between politicians, bureaucrats and contractors, will the government now gather the will to let the law take its own course? Now, opposition leaders like Prafulla Kumar Mahanta want the jailed ULFA leaders to be granted general amnesty. The question is — can the government really act on such a demand and give amnesty to the jailed ULFA leaders and not do the same with the DHD-J leaders? Can the government afford to have different sets of approaches to different militant groups? The findings of the NIA and the CAG audit is a test of the Assam Government’s will in tackling corruption, financial mismanagement, and also to crackdown on the politician-militant-bureaucrat-contractor nexus in the State that has now been established. Jatinga Festival 2010 from October 27.